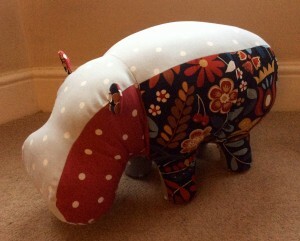 These gorgeous, colourful, fabric footstools make a great accessory to any home or are fantastic as a gift. Choose a range of coordinating fabrics to match your décor. Elephants stand at around 17"/43cm high by 26"/66cm in length. 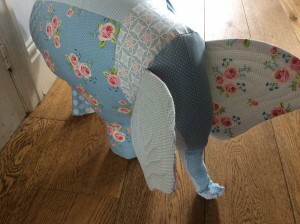 Additional costs: You will need; Elephant - 4 half metres & 1 fat quarter, Hippo - 4 fat quarters & 1 half metre of cotton fabric in a range of coordinating patterns/colours and thread. Calico(lining), filling and all other equipment is included in the cost. Please email me your choice of animal. Suitable for: Someone who has experience and is confident using a sewing machine.